Stowmarket Town were the visitors to Stoneylands on Saturday. Jack Durey’s hat-trick was the difference between the two sides in October, with Jack currently sidelined through injury it was a closer game on Saturday. Two sides struggling at the moment were never likely to produce a great game of football and so it proved. The match was constantly interrupted by some reckless challenges by both teams in innocuous areas of the pitch, when staying on their feet would have been a better option. Both sides picked up a handful of yellow cards and on another day might have received a few reds. It wasn’t a great spectacle for the small group of spectators, with very little football being played. But just when I was moaning about parting with £5 to watch such a scrappy game, a moment of class arrived in the closing stages. Ben Simpson’s excellent pass was met with instant control by Will Wingfield, who then finished in emphatic fashion. Stowmarket after leading for nearly 40 minutes will probably feel they should have won the game. On the other hand Melford did miss a penalty, the third spot kick Melford have been awarded this season and they’ve all been missed. Danny Twyman is usually a reliable penalty taker but shot wide on this occasion. 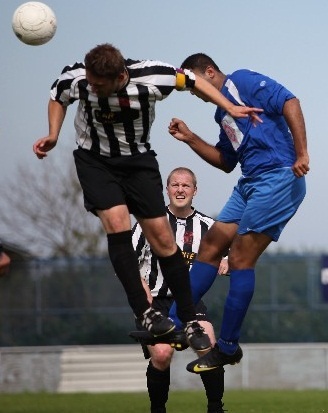 Helping the team out on Saturday was experienced defender Jamie Howe who last played for Melford about 10 years ago and is a well-known defender in the area having also played for AFC Sudbury and Sudbury Athletic. He currently plays for Wormingford in the Border League but as they didn’t have a game on Saturday and Melford were short at the back with Michael Owen unavailable, Jamie signed on a dual registration basis and had a solid game for Melford on Saturday. The Reserves proved too strong for their Stowmarket counterparts and came away from Greens Meadow with a 5-1 win, goals scored by Myles Clark (2), Errol Durell (2) and one for Justin Crissell on his return from injury who was playing his first full 90 minutes since September. Next up for the Reserves is a home fixture against Ipswich Wanderers (22nd December) in what will be the Reserves’ last match in 2012. Then follows a short break for Christmas before returning to action on 5th January at home to Woodbridge Town. The U18s have endured a frustrating time recently due to the weather, they haven’t played since early November but hopefully will get a game tomorrow (Wednesday 19th December) away at Brantham Athletic. The U18s’ first season in the Thurlow Nunn Youth League has gone better than anyone could have expected. They currently sit 3rd in the table, two of their players have represented Suffolk and six members of their squad have made Senior debuts for the 1st Team. The Ladies’ match on Sunday was postponed so they now have a break over Christmas before returning to action at Bury Town on Sunday 13th January in the cup. John Harrington’s side currently sit 3rd in the table, a very good foundation to build on in the New Year. And finally, Merry Christmas and Happy New Year to everyone and hopefully we’ll see a bumper crowd at Cornard United on 27th December (3pm kick off) for a local derby that both sides will feel they need to win. With ex-Melford trio Paul Grainger, Richard Grimster and Jamie Gregory all at Cornard now it will make for a more interesting derby than we’ve seen in recent years. In my last column a fortnight ago I wrote about how competitive the 1st Team were this season despite having such an inexperienced squad; Melford then went and conceded 14 goals in 2 matches! Losing heavily to a Braintree side that included 4 of their Conference squad was certainly no disgrace. Players of that quality, used to playing one division below the Football League, are obviously going to make a huge difference at Step 6 level. Maybe next year Melford could draft in 4 Luton Town regulars and it might make for a more even contest. In contrast, losing 6-0 at an under-strength Halstead Town is a bad result in anyone’s book. The only real positives on an otherwise disappointing afternoon were some eye-catching performances by the club’s Under 18 players, who were Melford’s best players throughout. However it would be unfair to criticise any of yesterday’s squad, because with a few exceptions they are very new to this level of football. It’s not realistic to expect players to step up to a higher level and never have a bad game or never make a mistake. You don’t need to be Jose Mourinho to work out the club needs to bring in some players who have played regurlarly in the First Division (or an equivalent standard), to help the young and inexperienced players, but in the club’s current situation that is easier said than done! But as always after a bad defeat it’s important to keep things in perspective. After last season’s financial crisis it’s a miracle the club is still surviving at all, so it will take a long time to recover and re-build. 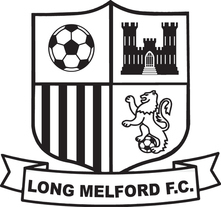 But we are lucky to have good people at the club who genuinely care about Long Melford FC, which gives us a fighting chance. At Stoneylands the Reserves were 2-0 up against their Halstead counterparts thanks to Stuart Whitehart’s first half double, before the visitors fought back to win 3-2. Well done to the Ladies who won 8-1 at Witnesham Wasps today and move up to 3rd in the table. John Harrington’s match report will be on the website soon. Next up is the U18s’ home match against Felixstowe & Walton Utd on Wednesday night, followed by the 1st Team’s bottom of the table clash against Stowmarket Town on Saturday. On the same day the Reserves travel to Stowmarket. All these fixtures could be under threat from the weather so please keep an eye on the website for updates during the week. Last week there was good progress made in the Cup competitions as the 1st Team reached the quarter finals of the Suffolk Senior Cup and the Reserves qualified for the semi-finals of the Chell Trophy, which sets up two big games to look forward to in early 2013…the 1st Team are at home to Crane Sports (12th January) and Reserves home v Walsham-le-Willows (5th February). On Saturday the 1st Team lost 2-1 at Saffron Walden Town, a good game to watch considering the difficult conditions but the injury to Walden keeper Paul Wood (who made 118 appearances for Melford) overshadowed the match and we all wish Woodsie well for his recovery. It was a deserved win for Walden who had the better of the play and chances. But nevertheless another good battling display by Melford who were solid defensively and dealt well with a lot of aerial balls in the box from corners and Joe Rudkin’s unbelievable long throws, probably the best long throw I’ve ever seen; not just long but flat and fast too. It’s not a very experienced 1st Team at the moment, using Saturday’s squad as an example I’d say 11 of the 14 players have played most of their football at a lower level. But although Melford are in the bottom three, the majority of matches this season have been closely fought with only CUP, Newmarket and Braintree beating Melford by more than one goal in the league this season. Which suggests the players who have stepped up from the Reserves, U18s and local leagues have done very well and are holding their own against most sides in the division. Making an impressive debut for Melford on Saturday was Luke Cresswell, who stood for election as a Labour candidate last year in Sudbury, so it was appropriate that he played on the left wing! The Reserves came from behind to draw 1-1 at home to Saffron Walden’s second string and now have a two-week break from action before playing Halstead Town at Stoneylands on Saturday 8th December. The Ladies’ match against Bacton United was postponed due to a waterlogged pitch, their next fixture is away to Ransomes Sports on Sunday 2nd December. The next match at Stoneylands is the U18’s home game against Hadleigh United on Wednesday, followed by the 1st Team at home to Braintree Town Reserves on Saturday. Firstly well done to Tony West and everyone else involved in yesterday’s charity match at Stoneylands. The match raised over £400 for Macmillan Cancer Support and Success After Stroke, thanks to a 100+ crowd; the final score was Macmillan All Stars 3 Long Melford XI 5. Since my last update a fortnight ago a lot has happened at Melford on and off the pitch, the combination of ups and downs that every club encounters; defeats for the 1st Team and Reserves, victories for the U18s and Ladies, injuries and departures, a successful Fireworks night, a scathing comment on the club’s website forum, 3 more Senior debuts for the club’s youngsters and a cheque for over £500 from the Suffolk FA (last season’s Senior Cup prize money). It won’t be the same watching Melford play without Ashley Skeggs in the team, after 5 years at the club. Also his family who were regular supporters at Stoneylands will be missed. But Skeggo’s move to Diss Town is a great chance to step up a level and play in the Premier Division. So best wishes to Skeggo and I’m sure he’ll help Diss climb out of the relegation zone soon. For several years the club’s 1st Team had one of the worst disciplinary records in the League, which not only cost a small fortune in fines but also reflected badly on the club. Thankfully we have turned the corner this season; Melford are currently joint 6thout of 38 clubs in the Thurlow Nunn League Fair Play Award. In league and cup matches this season, Melford are averaging exactly 1 yellow card per game (17 yellows in 17 matches) with 0 red cards. A huge improvement so well done to all involved in improving this aspect of the 1st Team. A big week ahead for the club, starting with the U18s’ local derby/top of the table clash with Cornard United on Wednesday night at Stoneylands. Then on Saturday in the Senior Cup the 1st Team travel to Ipswich to face SIL side Achilles, who were unlucky to be knocked out on penalties by Melford last season and will be tough opposition again this year. Meanwhile the Reserves make the short trip to AFC Sudbury hoping to avenge two defeats against Sudbury earlier in the season. The Ladies, who moved up to 3rd after their 4-1 win at Ipswich Valley Rangers yesterday, play at home to Brandon on Sunday. It was second v third (from bottom) at Stowmarket yesterday, two sides who had only won once in the League this season. Both sides went for the much-needed 3 points and attacked in numbers, as a result it was a very open match at times. Melford found themselves two goals down early on but fought back well to win 5-2 in a good team performance with all 14 players contributing. It’s fair to say that in recent years Melford haven’t had a reputation for being free-scoring, but it still came as a surprise to discover the last time Melford scored 5 goals in a league match was as long ago as October 2006! Melford’s squad on Saturday included 5 players under the age of 18, and again the youngsters gave a good account of themselves. What has impressed me most about the U18 players so far this season is that they all want to get on the ball and play attractive football, a good example being Will Wingfield’s pass of the season which led to Jack Durey completing his hat-trick on Saturday. There were impressive performances all over the pitch on Saturday with Chris Toole continuing his excellent form at centre half, alongside captain Michael Owen (who has been a much better signing than his namesake at Stoke City!). And of course Jack Durey was a constant threat and deserved his hat-trick. The Reserves beat their Stowmarket counterparts 5-3 at Stoneylands and they are back in action on Thursday night at neighbours Halstead Town Reserves (7.45pm) while on Saturday the 1st Team face Halstead at Stoneylands in the First Division Cup (3pm) followed by the Fireworks Night (see front page of website for more details). Results Forecast Update: One winner this week, who collects prize money of £50. Melford keeper Sam Mansfield underwent a major operation on Monday night to re-attach the collapsed lung to the chest wall. The operation was successful but Sam is obviously exhausted and in pain. Sam will hopefully be out of Papworth hospital by the weekend. Richie Partridge's short spell at the club (11 appearances/0 goals) has come to an end, he's left the club and last night was on the scoresheet for Team Bury in their win against Braintree Town Reserves. Another ex Melford player Danny Shipton played for AFC Sudbury's first team in the Ryman League on Saturday. Good luck to Brantham Athletic for the rest of this season's FA Vase, their reward for beating Melford on Saturday is a home tie against Cambridge University Press. On Saturday at Stoneylands the Reserves host neighbours AFC Sudbury in the Suffolk Senior Reserve Cup (3pm kick off and not 2.15pm as originally stated) while the 1st Team travel to Ipswich Wanderers in the league. Sam Mansfield’s car accident last week has obviously overshadowed Friday’s local derby. Several Melford players have visited Sam in hospital where he is making progress, but his collapsed lung is still not staying inflated. The club was fortunate to have talented former Team Bury keeper Liam Hastie ready to step up to the First Team at short notice on Friday, to replace Sam. After impressing in the Reserves this season, Liam’s home debut for the 1st Team against ended in a comfortable 3-0 win against Cornard United, in a match not helped by the wet conditions. Cornard are enduring another tough season but they worked hard throughout Friday’s match and in a local derby/Senior Cup tie were never going to be pushovers. 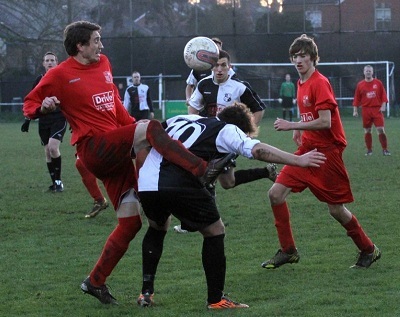 However, Melford created plenty of chances despite not being at their best and were unlucky to hit the woodwork twice. The draw for the next round takes place live on Friday on BBC Radio Suffolk (between 6pm and 7pm). It was an entirely local Melford team that played on Friday, with two 17 year-olds in the starting line up, which is good to see. And the decision to play the game on Friday proved successful with the gate of 88 about double what it would have been on Saturday. Next up is the FA Vase tie with Premier Division side Brantham Athletic, which is a completely different type of challenge; instead of being favourites Melford will be the underdogs. Melford have already surpassed expectations by reaching the 1st Round Proper and winning £1200 prize money (the club’s best Vase run since 2004/05). 31 places separate the two sides in the League, so Brantham rightly start as heavy favourites but Melford have nothing to lose. And as always under Robbie and Jules, the players will give 100% whatever the scoreline. Good luck to Dan Cann who has moved on to Saffron Walden Town, where he will link up with his former Melford team-mate Paul Wood. Canno had a ‘one in two’ scoring record at Melford, which takes some doing especially as Melford were in the bottom half of the table for much of that period. Most of the Cup Final squad at Portman Road in May have now left the club, which is a shame but its also part and parcel of football at all levels. Clubs go through different eras, managers and players leave which means clubs have to rebuild. At the moment Melford are at the start of a new era and in a short space of time Robbie and Jules have worked miracles to build a competitive squad since taking over in July in difficult circumstances. There will be setbacks at times, which is inevitable for what is basically a completely new team, but things are progressing nicely. Off the pitch, the Co-Op have come on board in an exciting new sponsorship development and the new kit sponsored by Pizza Town in Sudbury has smartened Melford’s image up, as the old shirts were slowly falling apart. The Reserves travel to Newmarket Town in their last Chell Trophy group match on Wednesday, ideally needing a win to put the pressure on group leaders AFC Sudbury. Then on Thursday the U18s also visit Newmarket (in the Thurlow Nunn Youth League Cup) where Craig Power’s Melford team will want to build on last week’s impressive 4-1 win at Witham Town. The 1st Team made it 3 wins in a row on Saturday, with a 2-1 win against Swaffham Town in the league [read Chenoberet's match report HERE]. Although behind for about 50 minutes, Melford created more clear-cut chances than their Norfolk visitors, so it was a well deserved 3 points. The Melford defence had another good day and restricted Swaffham's dangerous forwards Joe Jackson and Alex Vincent (12 goals between them already this season) to very few genuine chances. Melford again showed great character to stage another late fightback, improved fitness levels also seemed to play a big part in Melford's strong finish to the match, and both goals were expertly taken by Luke Simpson and Ashley Skeggs. As great as the two FA Vase wins were (and of course the £1200 prize money) it was important Melford got their first League win of the season sooner rather than later and to get it against a team 5th in the table must have been very pleasing for Robbie, Jules and the players. Melford got the monkey off their back today with their first win of the 2012/13 season, also a first win for manager Robbie Benson. After the early FA Cup exit, Melford looked determined not to fall at the first hurdle of the FA Vase and despite a few anxious moments they got the job done to secure £500 in prize money and an away tie at Woodbridge Town on Saturday 15th September. The win was a nice reward for the players' efforts during a tough opening month for the club. After racing into a 2-0 lead through Errol Durell and then Jack Durey's wonder strike, this looked like being a comfortable win for Melford. However, the visitors improved as the half progressed and pulled a goal back before half-time following a well worked move. Bowers & Pitsea had a confidence boosting win against their local rivals Basildon United on Wednesday and looked increasingly dangerous going forward with prolific goalscorer Calvin Poku catching the eye. Melford lost Durey and skipper Justin Crissell to injury in the second half and were under pressure for long periods with keeper Sam Mansfield making a couple of crucial saves. It was hard work for Melford who didn't have the attacking outlet they'd had in the first half. There was the bizarre sight of Martin Westcott playing as a makeshift centre half, which actually worked better than you might think, but with no Westy up front Melford had no one to hold the ball in Bowers & Pitsea's half. Melford hoped to contain Bowers & Pitsea and pinch a goal at the other end from a counter attack or set piece and that's how the crucial third goal was scored. Paul Barnes gambled on the visitors' keeper spilling Dan Cann's free kick, which is exactly what happened, and Barnes netted the rebound to effectively send Melford through to the next round. Looking back at Saturday’s 1-1 draw with Team Bury, its hard to believe Melford finished the match with only one player from the Cup Final squad in May, namely Justin Crissell. The other 15 players involved at Portman Road have either left the club or were injured/unavailable on Saturday (or in Martin Westcott and Dan Cann’s case were substituted in the second half). Incredibly Justin has already played with 8 different players in the Melford defence this season (plus two keepers) and we’re only in August! It highlights what a challenging start it has been for new manager Robbie Benson. At this time of year the unavailability of players was to be expected due to holidays/weddings/etc but the bad luck with injuries has made it particularly tough. Saturday’s match saw Melford create plenty of chances in the opening 60 minutes but, apart from Dan Cann’s clinical strike, they weren’t converted. Team Bury pushed hard for a winner late on, but Melford held on to take a point. Its early days but what we can learn from Melford’s opening matches is that its going to be a largely local group of players this year, plus a few from further afield, and it will be a team that battles for every point. We’ve also seen Melford play some good flowing football in the last two home matches, particularly in the first half against Whitton. The Reserves’ league campaign starts on Saturday under the new management team of Tony French and Mark Dack, away to Hadleigh United Reserves. Several players from last season’s team have left the club including Stu Alston (to Hadleigh Utd) and Dan Manser (to Saffron Walden), hopefully we’ll have an update from the Reserves’ when the season gets underway on Saturday. What collection of whizz kids (highly paid no doubt!) came up with an August 4th start to the Football Season? Right when parents (players) contemplate taking the family holidays and some players are in the midst of a League cricket programme. Methinks quite silly. Last season was good on the field, but a nightmare off it, the worst I can recollect over a fifty year connection with LMFC. To that end hopefully the introduction of Richard Powell and his son Chris as Directors will strengthen the Admin side, together with Pippa Salt on the Commercial/Sponsorship side of the Club. We thank Jason Maher for his great efforts at the Club. Jason stood down, a month ago as Team Manager. Some Essex based players have left the Club, the most notable being keeper Paul Wood who has joined Saffron Walden Town, we thank Paul for his efforts and wish him well for the future. Congratulations to Robbie Benson, Jules Mumford and Jim Walker who make up the management team and we say well done in getting together a viable squad in such a short time. We started our mid summer campaign against Great Yarmouth, who commanded the first half and we did likewise over the second period. The result a 2 -1 defeat saw us miss a penalty in the last minute of the game. The following Wednesday we took on Whitton, we managed a draw one goal each, we perhaps had the chances to win the game. After a very trying season off the field last season, the impact was tempered somewhat by the playing success, for which we thank the players and Jason and Jules, the sad blow being the departure of Jason Maher just before the start of the new season. Great credit therefore to Robbie Benson, Jules Mumford and Jim Walker, for picking up the pieces and finding a team for the new start. The game against Yarmouth though sometimes a struggle did show a good team spirit, and with more players in the pipeline things might be better than expected after the departure of some of the Essex based players. Off the field it is good to see Richard and Chris Powell becoming Directors of the Club with Chris taking on the financial mantle, with the assistance of professional book keeper Dora Marchment, with Simon Garden taking a well earned rest from some of his many duties. The Club record their thanks to Simon for all his hard work. We need more help at the Club, a few hours a month or week would be wonderful. Duties we need to cover are Bar duties, Ground maintenance, property maintenance etc, so if you can help (unpaid) please make contact with Chairman Alf or Richard Powell. There is also a need to raise more income, so if you can organise say a sponsored walk, jumble sale, car boot sale, raffle etc we would be pleased to hear from you. We also need more sponsors and advertisers so again if you can help please let us know.